This article is about the minigame from Mario Party 2. For other games based on Ice Hockey, see Ice Hockey. For other uses of the term "Hockey", see Hockey. 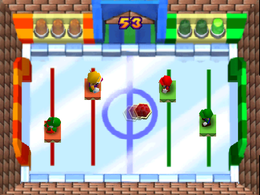 Speed Hockey is a two-on-two hockey minigame in Mario Party 2. It returns in Mario Party: The Top 100. 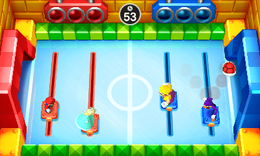 The mini-game involves the two teams on blocks. They try to block the Koopa shell going into their goal while hitting it into their opponent's goal, as in real-life hockey. Much in the vein of classic arcade game Pong, the players may move only up and down to bounce the shell back. The shell moves faster as the game goes on. The first team to get three goals, or the team with more goals when the timer runs out, wins. Game Rules – "Knock the shell into your opponents' goal. The first team to score 3 goals wins!" Game Rules (Mini-Game Coaster) – "Knock the speeding Koopa shell into your opponents' goal. Score the most points to clear the game." Advice – "The more you hit it, the faster the shell moves! Make sure you don't score on yourself!" Description – "Hit the bouncing shell into your rivals' goal!" On-screen – "Shoot the shell into your rivals' goal!" French OK? Hockey! OK? Hockey! This page was last edited on August 16, 2018, at 16:30.